Working with 8 young people (ages 13-16) at Newbridge Inclusion Centre, poet Patrick Jones and rapper Rufus Mufasa created a series of rap and spoken word compositions over a period of just six weeks. The centre is a specialist educational facility provided for students with a history of challenging behaviour in the classroom; not just at Newbridge, but all schools in Caerphilly County Borough. The young people are mentored and encouraged by a group of committed teachers and staff, including Deputy Head Tony Gallagher. 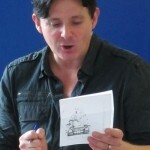 Himself an actor and performer with a passion for script-writing, Tony Gallagher is keen to encourage creative activities for the students of the centre, to improve their aspiration, confidence and learning skills. The young people’s words – link below – were recorded and put to a beat by Rufus Mufasa and Jamey Peace, before being shared at a presentation ceremony at Newbridge School in July 2015.